A compact crossover SUV like the 2014 Honda CR-V offers great features, plenty of space for families, smooth handling, and better fuel economy than a traditional SUV. If you’re thinking about the CR-V, which is available now at our Mechanicstown-area Honda dealership, you may also be considering the 2014 Toyota RAV4. Comparing features is one of the best ways to narrow down the choices. Let’s take a look at both models, trim by trim. The 2014 Honda CR-V LX and 2014 Toyota RAV4 LE are the first of three trims for both compact crossovers. They’re reasonably equipped, though the CR-V’s base price is a little lower than that of the RAV4. Both models have the basics that Middletown drivers expect these days, such as air conditioning, full power accessories, keyless entry, and an auxiliary audio jack. There are also a few other perks like iPod connectivity, a rearview camera, and Bluetooth. The 2014 CR-V LX does offer a major feature advantage to Mechanicstown drivers in the form of Pandora internet radio compatibility, which you won’t find on the 2014 RAV4 LE. At the second trim level for the two models, each adds on a few similar features like a sunroof, larger 17-inch wheels, fog lights, a cargo cover, and improved audio systems. Honda adds on body-colored mirrors and door handles that are really sharp for this trim, giving it a slight stylistic edge over the RAV4. The 2014 Honda CR-V EX-L and the 2014 Toyota RAV4 Limited are the top-of-the-line trims for both models. Each adds features like a leather-wrapped steering wheel, eight-way power driver’s seat, and heated front seats. The 2014 Honda CR-V EX-L does have a few feature advantages, like a seven-speaker audio system with a subwoofer and full leather upholstery. Toyota gives drivers just synthetic leather. Each model also offers some additional features not found in the main trim levels. To each model, you add an advanced navigation system with voice controls and real-time traffic information. The Honda CR-V also offers a rear entertainment system, a feature not found in the RAV4. It’s a must-have for families who go on a lot of long car trips. 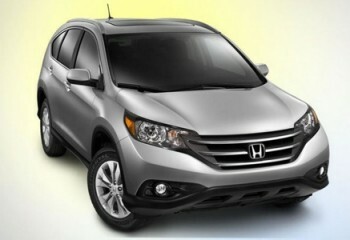 In our opinion, the 2014 Honda CR-V has features that make it a great choice for you and your family. To learn more about all aspects of the most recent CR-V, come to Middletown Honda. We’re located at 520 Route 211 E. in Middletown, NY, only a few minutes away from Mechanicstown. If you have any questions or want to schedule a test drive, feel free to contact our Honda dealership.